Oregon Gov, Kate Brown speaks to the crowd of supporters after her 2016 election victory. Oregon Gov. 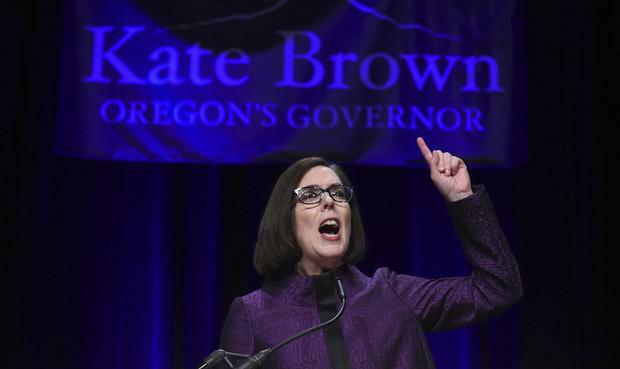 Kate Brown this weekend reported a pair of $250,000 contributions from a gun control group and from the Democratic Governors Association. Brown has been a staunch supporter of tightening Oregon’s gun laws and her re-election campaign is now getting help from Everytown For Gun Safety. That group has received major funding from billionaire Michael Bloomberg, the Wall Street entrepreneur and former New York City mayor. The governor signed legislation in 2015 that expanded background checks for gun purchases. Two years later, she signed a bill that allows judges to temporarily confiscate firearms from people found to be at “extreme risk” of violence. Brown’s Republican challenger, Rep. Knute Buehler of Bend, opposed both measures. He did part ways with many of his fellow GOP legislators earlier this year to back a bill that expands restrictions on gun ownership by domestic abusers. The Democratic Governors Association made the $250,000 contribution to Brown after Buehler received $750,000 from the Republican Governors Association. The GOP group also financed about $300,000 in TV ads that included attacks on Brown. New campaign finance disclosure reports also show that Buehler received $100,000 from the Oregon Realtors Political Action Committee. Both of these party organizations raise money from a wide variety of donors nationally that they then pour into gubernatorial races around the country.